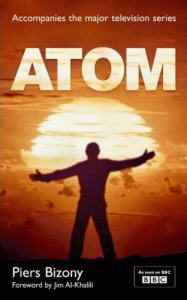 A companion to the BBC TV series of the same name, Atom charts the development of atomic theory from its genesis in ancient Greece, through its true beginnings in the 18th century, right up to the present day, all viewed through the lives of the scientists who made the discoveries. This method makes Bizony’s book more accessible than many on the subject, and it’s an interesting and absorbing read; science not as some abstract concept but as the daily pursuit of real people. The danger with writing a popular science book is that you risk alienating whole swathes of your audience if you don’t get the balance between too little and too much information just right. Too little and your more knowledgeable readers will get bored, too much and you get another Brief History of Time: wildly popular maybe, but no one (who isn’t already an expert) bothers reading past chapter three. Atom gets this balance perfect, and is a great way for anyone not trained in physics – and even those that are – to learn more about this fascinating subject, and in particular the stories of the real people behind those famous names.